Yaaaaaaay, happy 2017 wedding season!! I'm so thrilled to have been able to spend the day with such a loving group of people. Things couldn't have gone any better! These photos are just some snaps I grabbed on my iPhone - stay tuned for the professional's! Jessi and Brodie first contacted me back in November when my website first launched, and I knew right away I wanted to work with them! Over the last few months I've had the absolute privilege of working closely with them and getting to know them as a couple, and last night I had the pleasure of watching them profess their love and join together in marriage. They are both just the absolute sweetest people individually and when you put them together, they become overwhelmingly adorable, kind and bursting with love. We started our day off bright and early with hair by Denise Bernard and make up by Rebecca Powers. These two worked so smoothly alongside each other, they were a dream of a team! While the girls got ready upstairs, the boys commandeered the couples' basement man cave while Brodie anxiously awaited seeing his bride. What do you do as a wedding planner when, on the morning of the wedding, the bride realizes she doesn't have a something borrowed or something blue? You rush home to grab your blue ribbon, hot glue gun, and rose quartz crystal. Maid of Honour Lexi suggested blue ribbons on her heels, so off I went and made two tiny baby blue bows, and then followed up with adding baby blue ribbon lacing to her gorgeous white sparkle Kate Spade Keds for the reception. How insanely cute did those turn out? I am completely obsessed with her heels! Rose quartz, aside from being gorgeous, is known for having many amazing properties including enhancing love. This specific crystal was given to me by my aunt on my wedding day, and so I thought it would be the perfect item to loan to Jessi for her wedding day. I carefully wrapped it into her bouquet so it would always be close to her. After everyone was dressed, we were off to the PEI Brewing Company for the ceremony. Some of you may know this space is near and dear to my heart as I got married here as well. This was my first event at the venue since my own wedding, so it was really special to be back. Jessica, Kyla and the rest of the staff were fabulous and I am beyond excited for the rest of my weddings with this great team this summer! After the ceremony, we were off for pictures! Now, it's April and this is Prince Edward Island. But all things considered, we actually lucked out. We started out down at the waterfront and it was windy and pretty chilly but the group and their families were such troopers! 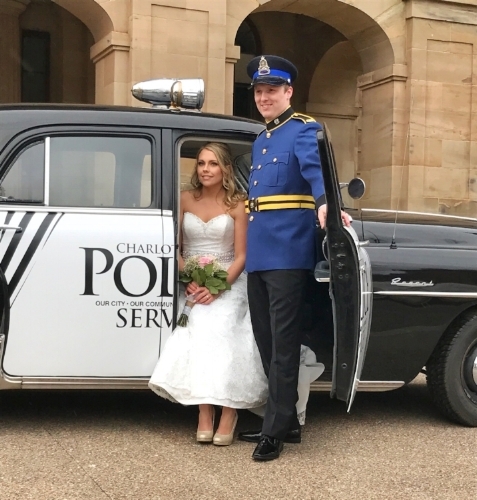 After the waterfront, we took a drive up to Province House where Brodie had parked Charlottetown Police Services' vintage squad car - so cool! He donned his uniform and we got some gorgeous shots. But I mean, how can you not when your bride looks like a model and your groom is in uniform? After the photos we were back to the PEIBC to finish off the night with a pizza buffet, tear jerking speeches, Instabooth and some dancing! This wedding will always hold a special place in my heart and I'm so looking forward to watching Jessi and Brodie grow and thrive in their relationship. Their moms are already asking for babies - twins, in fact, so they don't have to fight over who gets to hold them! Head over to their portfolio entry if you want to see some more pictures of this event!